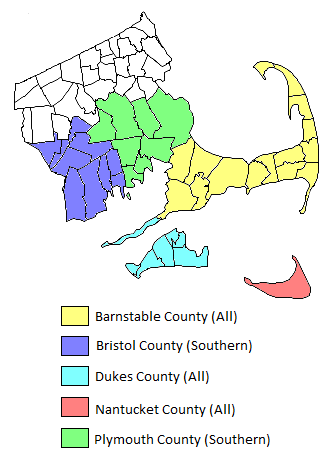 The Counties of BarnstableW, DukesW, and NantucketW in Massachusetts. The cities and towns of AcushnetW, BerkleyW, DartmouthW, FairhavenW, Fall River +++ W, FreetownW, New BedfordW, Somerset *** W, Swansea *** W, and Westport *** W in Bristol CountyW, Massachusetts. The cities and towns of: CarverW, LakelvilleW, MarionW, MattapoisettW, MiddelboroughW, PlymouthW, RochesterW, and WarehamW in Plymouth CountyW, Massachusetts. +++ Fall River, MA is shared with Hidden Flame (Providence, RI). *** A three-mile-wide margin on either side of the RI-MA border, where Hidden Flame (Providence, RI) and Rage Across the Cape (Cape Cod, MA) territories abut, is shared between both games as a generally plot-neutral travel zone. You can also view the Rage Across the Cape territory claim on the One World by Night website here. The Rage Across the Cape Interactive Territory Google Map is marked with a variety of sept landmarks and places of interest, and is continuously updated by the staff. Click here to open the map, along with it's listing of places, in a new browser window or tab. Or click here to open a full-screen view, with no place listing, in a new browser window or tab. If you have a suggestion for a map addition, please email us at ratcstaff@googlegroups.com. Blue = Umbral Places; places that exist mainly/only in the Umbra. Green = Realm Places; places that exist mainly/only in the Realm. Yellow = Mixed-Realm Places; places where both Realm and Umbral representations exist and/or are of relatively equal importance. Red = Cities and Towns. 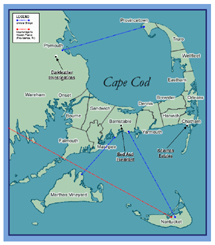 An overview map of the Cape and islands, including Martha's Vineyard and Nantucket. Includes umbral bridge and moonbridge paths, as well as several points of interest, which include Soloman Estates and the Bed & Breakfast. 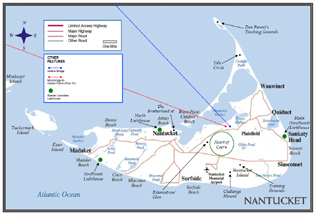 A complete map of the island of Nantucket. The Vigilant Light Bawn covers the entire island and surrounding waters. Includes umbral bridge and moonbridge paths, Caern Heart and sept points of interest, including the Brotherhood of Thieves. 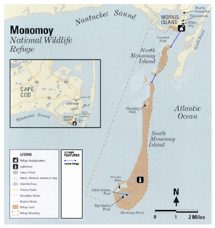 A complete map of North and South Monomoy, including umbral bridge paths and sept points of interest.